I don't know what's the matter with me lately. I've been getting impulsive...rude...and reality seems further away everytime the subject of our presidential election comes up. 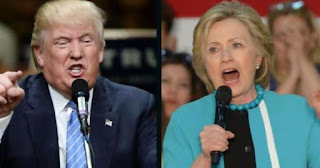 Why am I planning to watch the third presidential debate tonight when I know it's going to be another trainwreck, and truth will be one of the many casualties? But it may be something else. Something more sinister. Am I being brainwashed? The deluge of lies in the mainstream media and social media soaks my consciousness daily. I feel like an MMA fighter ready to tap out...just end this farce of an election! No matter which candidate wins, I'm going to feel like I lost something very basic; my belief in America and what it stands for. That's because I don't know what will stop the hating in our society. Or, the corruption. The aftermath of this political bloodbath may be increased violence. In an already gun happy country, this prospect seems all too real. Tonight is the last time the two candidates will face off in a debate. I know what's going to happen. So do you. But we're going to watch it anyway, even though we'll feel like taking a shower afterward! Took a shower. Didn't help. Thought about an enema but also thought why should I be the only one enjoying my self. Ha! Ha! The only other thing to do is to smoke yourself into oblivion with some good weed! "Strawberry Fields Forever..."